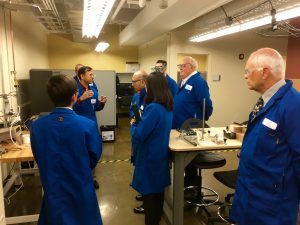 October 18, 2016 – Springfield, MO – Brewer Science welcomed Japanese Ambassador Kenichiro Sasae and Congressman Billy Long (MO-7) to its Springfield facility located at the Jordan Valley Innovation Center (JVIC) on October 12, where the company showcased the global reach of Brewer Science technology. “We appreciate the opportunity to showcase our company’s technology to Japanese Ambassador Kenichiro Sasae and the leadership of Congressman Billy Long in recognizing the value that Missouri businesses bring to the global marketplace. A special thank you to Congressman Long for hosting the ambassador and his ongoing work to support growth in Missouri entrepreneurship, advanced manufacturing, and high-tech jobs,” said Dr. Terry Brewer, founder and CEO of Brewer Science. “Brewer Science isn’t only a vital part of our manufacturing community, but it’s also a vital part of Missouri’s economy. That’s why I was so excited to give Japanese Ambassador Kenichiro Sasae a tour of their facility. Missouri’s exports to Japan already account for 10,000 jobs both directly and indirectly. As a Congressman who sits on the Energy and Commerce Committee, it’s important to me that businesses like Brewer Science don’t feel burdened by overregulation and want to continue their business in southwest Missouri,” said Congressman Billy Long. Brewer Science provided Ambassador Sasae and Congressman Long a demonstration of the company’s sensor devices. Brewer Science’s carbon nanotechnology design allows its sensors to signify a change within milliseconds, faster than the human eye can blink. Creating innovative technology is the company’s strength. The company has been actively exporting to Japan for many years. Brewer Science, Inc., and Nissan Chemical Industries, Ltd., located in Japan, have a long-standing business relationship. For nearly 20 years, Brewer Science has licensed its ARC® technology to Nissan Chemical. This relationship focuses on continuing access to an expanded portfolio of the most advanced materials, and allows access to a dual supply of products from Brewer Science and Nissan Chemical under a joint label to customers in Asia. Both companies are committed to guaranteeing business and industry continuity by providing an uninterrupted leading-edge product supply for customers in Asia into the future.